I always think of October as a golden month. The last rays of summer sunshine still have enough strength to warm your face. Leaves are slowly turning to beautiful shades of yellow, orange and red. We enjoy autumn vegetables and soups: spiced butternut squash and pumpkin, sweetcorn and carrots. Also in season this month are kale, leeks, cabbage, celeriac and fennel. Fruit trees are laden with apples and plums for crumbles, you can find blackberries on almost every hedgerow, and don’t forget to make sloe gin now and it will be ready for Christmas. Scallops, mussels and oysters are delicious at the moment, and now the shooting season is underway, try some local pheasant, partridge, grouse, venison or wild duck. 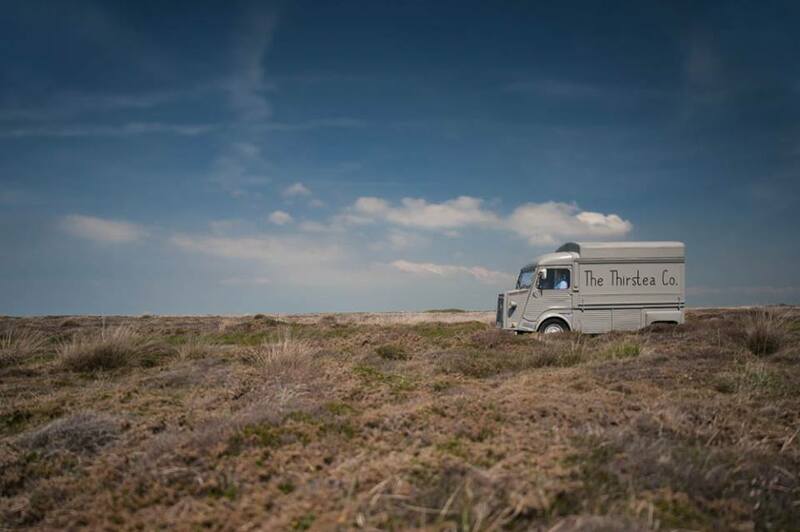 After a successful first season of trading from their trusty Citroen van, Seth and Jodi will be serving up warming soups this autumn in addition to their delicious teas, coffees and homemade cakes. The Thirstea Co. will be based at Towan Beach on the SW Coastal path, on St Anthony’s Head on the Roseland Peninsula from Tuesdays to Sundays through September and then for long weekends during October, and every day of October half term. For more info visit their website or follow them on Facebook. Don’t miss Heligan’s harvest celebrations from 27 September until 12 October. The traditional Pumpkin Display will take centre stage, with other beautiful displays positioned around the garden and buildings. At 2pm daily between 29 September and 12 October join the gardeners and chefs of Heligan in the Reserve Gardens. Learn about heritage fruit and vegetable varieties, and taste them as they are cooked simply in front of you. The Heligan tea room will be serving up homemade, seasonal dishes daily, and Friday 3 October sees a special Taste of the Heligan Harvest supper where you can enjoy a feast in the company of the gardeners. £37 per person. Booking essential. For more details and general admission prices visit www.heligan.com. Patch & Acre in Penzance is hosting a weekly farmers’ market from Sunday 14 September 2014. In addition to the regular market, the store will also be holding the first of a series of car boot sales in the car park on the same day. Taking place every Sunday at Ludgvan Leaze from 10am to 3pm, 16 local producers and craftsman will exhibit at the farmers’ market selling wares including jams and preserves, local seafood, meats, cheeses, wood carvings and fused glass products. Sneaking into the October Foodie Diary is the Newquay Beer Festival, which will be held at Hendra Holiday Park from 19-21 September. Over 60 real ales, beers and ciders will be on offer and accompanied by live music. The event raises money for local charities and a 3 day ticket is £8 (or £5 for CAMRA members). Single day tickets are £3 and camping is also available – book online. Saturday 4 October sees the Eden Project beer festival, in conjunction with St Austell Brewery, with a day of brewing demonstrations, tastings, workshops and almost one hundred speciality beers. In the evening enjoy live music and food and try an even wider selection of exclusive beers. Tickets are £10, for more details see online. The Falmouth Beer Festival runs from 23-25 October at the Princess Pavilion and features over 200 real ales, ciders and perries. Open 8-11pm on the Thursday and 11am-11pm on the Saturday and Sunday, there will also be live entertainment. £10 entry includes a glass, programme and beer tokens. 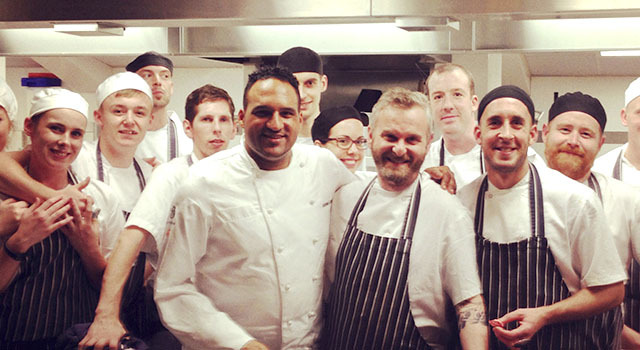 On Tuesday 7 October, Fifteen Cornwall welcomes back chef Michael Caines MBE for one night only. Along with Fifteen’s Head Chef Andy Appleton, Michael has created a gastronomic five course tasting menu, and wines will be presented and paired by the legendary Cullen Vineyard. The menu, which is still a secret, is guaranteed to feature show stopping dishes, incredible ingredients and fabulous flavours. Book now to avoid disappointment. 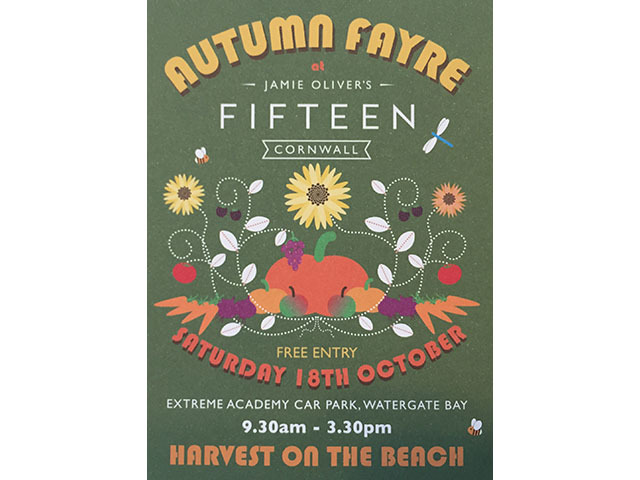 Fifteen Cornwall’s biannual food market returns to the car park at Watergate Bay on Saturday 18 October. Expect a mouth watering selection of food stalls including Da Bara Bakery, Buttermilk Confectionery, Cornish Duck Co., Origin Coffee, Deli Farm Charcuterie and Stein’s Patisserie. Cookery demos kick off with Josh Linfitt’s breakfast cocktails at 10am, followed by Stein’s Stuart Pate, Fifteen’s Andy Appleton and Chris Eden amongst others. See the full programme. Cornwall Food Foundation will be on hand with family fun, including planting your own veg, building your own breakfast, making smoothies on a bike (!) and face painting. MORE INFORMATION: Free entry. For more details see fifteencornwall.co.uk. Between 29 September and 24 October you can enjoy a three course lunch at Fifteen Cornwall for just £21. We can highly recommend this great value lunch – the exceptional food and service here (not to mention the location) never disappoint. Dishes will feature the best of the Cornish harvest, served with an Italian twist and a stunning sea view. See the sample menu. For reservations phone 01637 861000 or book online. Food lovers will be flocking to Boscastle over the weekend of 4/5 October for the annual Food, Art and Craft Festival. Chef demonstrations will be compèred by BBC Radio Cornwall presenters, and the fantastic line up of chefs features Michelin star holders Paul Ainsworth, Nathan Outlaw and Chris Eden as well as many other talented local chefs including Adrian Oliver, Ben Prior and Tom Hunter. On the Sunday morning the Cornwall Chefs’ Club will answer your culinary questions in a Q&A session. For more details see the website. The main marquee near the harbour will contain over 20 food and drink stalls, as well as art and craft exhibitors. The Falmouth Oyster Festival celebrates the start of the oyster dredging season and runs from 9-12 October in Events Square. 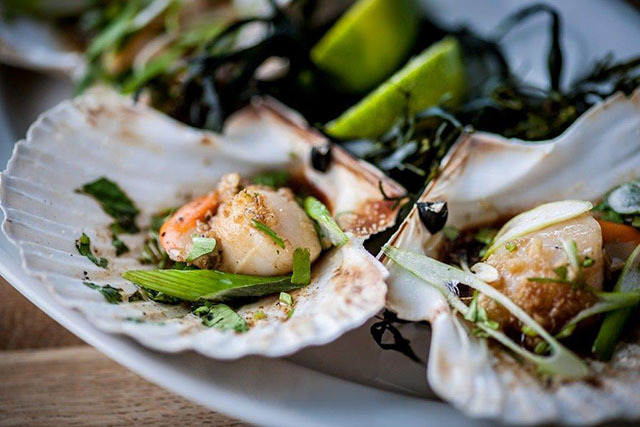 This is always a hugely popular and well attended event featuring a Cornish produce and craft marquee, oyster and seafood bars, ale and wine bars, hot and cold food stalls, children’s entertainment, cookery demos, an oyster shucking demo and live music. For full details visit the event’s website. Wave goodbye to the last of the evening summer sun with a cocktail in hand, a sunshine themed barbecue and live music. Food includes burgers with pickles, slow cooked smoked brisket and pulled pork. Grilled flat breads will be loaded with spiced lamb koftas, along with halloumi, jewelled cous cous and Beach Hut slaw. As part of this season’s Making Project, Hay Studio are holding a bread baking course. Under the guidance of Iain Shillito (of Blue Bus Catering) learn how to make and bake speciality breads. On 4/5 October Trelissick is holding a fun Apple Weekend where families can learn more about apples. During the weekend the newly restored ancient apple press will be used to press apples from the orchard and visitors will be able to taste this year’s fresh apple juice. For more details phone 01872 862090 or email [email protected]. 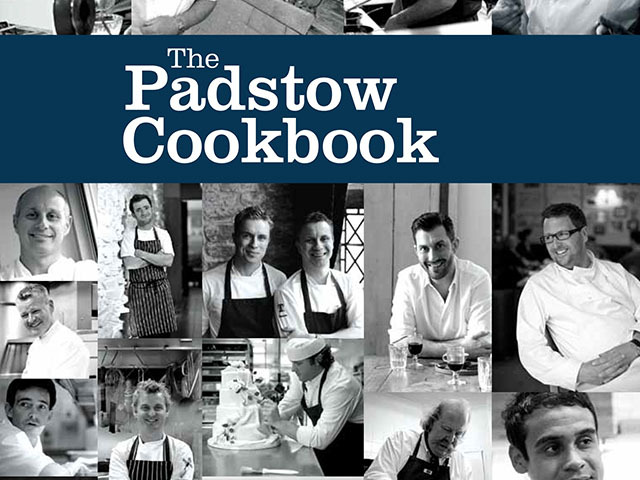 The 2012 Padstow Cookbook was a huge success and raised much needed funds for the fabulous Padstow Christmas Festival. The 2014 edition of the book will be launching at the end of October. This second book includes a foreword by Paul Ainsworth and a mouthwatering selection of new recipes from chefs who will be appearing at the festival. Rick Stein’s Fish restaurant in Falmouth is set to host their first ever charity lunches. Diners will enjoy a three course lunch for £12.95 with an additional £2 cover charge donated straight to British Red Cross. Head chef Luke Taylor’s three course lunch menu includes dishes such as Thai fish cakes, goujons of flat fish and cod curry. The lunches will take place at the restaurant, located on Events Square, from 12-2.30 pm daily from 1–24 October. No bookings necessary but for larger tables please phone 01326 330050. Potluck Cornwall, who meet regularly to chat about Cornish food, have two events planned this month. On 5 October join Caroline Davey (Fat Hen Wild Food Cookery School) for a two hour wild food taster walk. 9am start, £10 per person. A Halloween event will be held at Roselidden on 31 October. For more event details and how to book see the website. 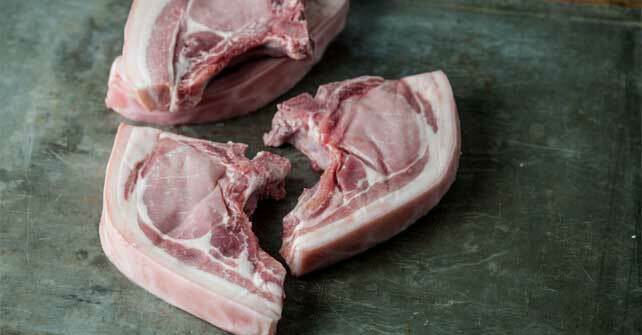 Bedruthan Hotel is hosting a butchery and sausage making course, beginning with a demo of butchering the carcass, the uses of different cuts and the importance of provenance. In the afternoon you will be taught how to bring out the best flavours in your meat and given recipes to try at home. Finally, you will learn the art of sausage making – from hand mincing the pork, mixing your choice of flavours, stuffing the skins and tying up traditional links. Lunch is not included but there will be a break when guests can eat in the Wild Café. 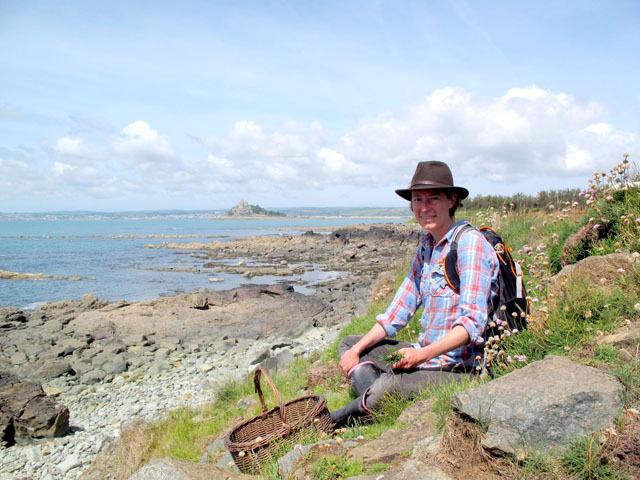 Forager Caroline Davey is teaming up with The Gurnard’s Head for a coast to coast walk on 15 and 16 October. The walk begins at Mousehole, via the artists’ residence of Lamorna, the famous Logans Rock, the sandy coves of Pedn Vounder, Green Bay, Porthcurno and Porthchapel and the Minack Theatre on the south coast, to the wild granite cliffs of the north coast, past Land’s End and Sennen Cove to Cape Cornwall, then on to the mining stacks of Levant and Geevor tin mine, the breathtaking beauty of Bosigran cliffs and finally to The Gurnard’s Head. This is a special “sleepover” package and includes transport, dinner, bed and breakfast. Please contact The Gurnard’s Head for more details. 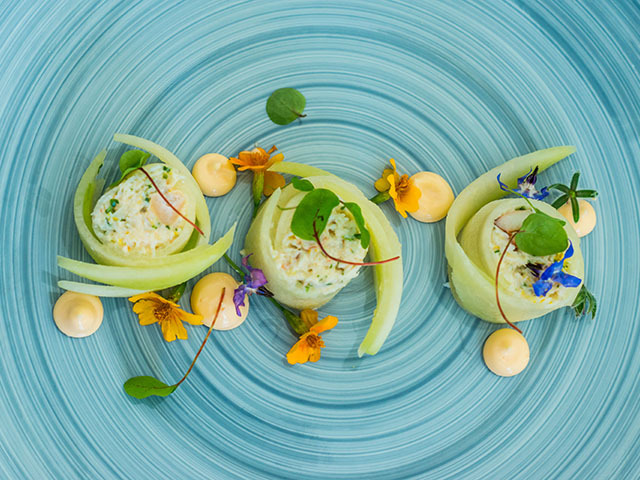 St Moritz Hotel have put together a fabulous three night gourmet break package comprising a 5 course tasting menu in the St Moritz restaurant, a 5 course tasting menu at Fifteen Cornwall, and a 3 course dinner at Rick Stein’s Seafood Restaurant. WHEN: 7 September to 14 December (excluding October half term), Sunday arrival. COST: Price per person for transport, dinner, bed and breakfast. King/twin room £375, ground floor suite £425. The 2015 Good Food Guide has been published, with a fantastic selection of Cornwall’s restaurants. Congratulations to all those who have been featured, especially those who made the Top 50 Restaurants: Restaurant Nathan Outlaw (4th) and Paul Ainsworth at No 6 (33rd); and The Springer Spaniel who were 21st in the Top 50 Pubs. The National Trust are putting on two interesting food-related events at Lanhydrock this month: “Seed and Sow” on 16 October and “Fascinating Fungi” on 26 October. For more information phone 01208 265950 or visit their website. Congratulations to Camel Valley who won Cornwall’s only Gold, 2 Silvers and Bronze in the South West Vineyards annual competition. Emma Gunn (author of Never Mind the Burdocks) is leading a foraging walk at Treraven Farm near Wadebridge from 2-4pm on Sumday 28 September. £6 per adult, children free. Phone 07792 197949 or email to book a place. Nancarrow Farm are hosting their first feast night on Saturday 18 October with nibbles and hedgerow aperitifs, farmhouse platters from this summer’s harvest and wood fired lamb, £30 per head. See website for details. The Llawnroc are planning their first Diners’ Club on 11 October with live music from Helen Taylor. £25 per person. Phone 01726 843461 for reservations. Trevaskis Farm’s Apple Day takes place from 10am to 4pm on Sunday 5 October. Hog roast, cheese tasting, kids’ corner, apple tasting, ciders and ales, pumpkin hunt, toffee apples and more. Free entry. Nat Tallents, who featured in the 2012 programme ‘Master Chef The Professionals’, has joined the Lusty Glaze team as Head Chef. Her autumn menu sounds delicious, and each week there will be a new Sunday menu. For more details, and for the Christmas in the Cove banquet menu, served November to January, see next month’s Foodie Diary. Truro College’s Spires Restaurant reopens this term on 13 October. Great value meals are devised and cooked by students, so you can support the future stars of the catering industry by dining here. Stephane Delourme has created a mouthwatering menu to accompany a selection of wines from New Zealand’s Archangel Winery. The six course feast will be held in the Padstow Seafood School on Thursday 9 October. Tickets priced at £105 per person, including wine. On Wednesday 22 October Stein’s Deli is holding a “Pink Day” in aid of breast cancer charities. A raffle and demonstrations from Polgoon Valley will run throughout the day. If you have food news then please send us an email and we’ll do our best to include it. great blog as always!! So much cool stuff happening I had no idea about. The pork butchering foraging walk and tea on the coastal path, great stuff!thanks!